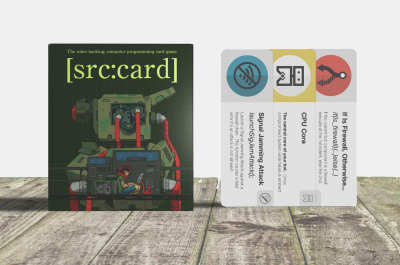 Src:Card The Card Game – The Robot Hacking, Computer Programming Card Game has launched on Kickstarter. Sept, 2015 – Src:Card Games has completed their first standalone card game: Src:Card. Src:Card is a two player (3-4 player with expansion) card game that pits players against each other as nation states. Each nation has one super robot with the ability to conduct global warfare. With the days of human combatants in the past, players must write code in order to defeat the all-powerful combat robots. Each player alternately develops its robot’s defences and programs an attack against its opponent’s battle robot. The game uses fundamental concepts from programming in order to facilitate the attack mechanisms within the game. The dynamic nature of building robotic defences leads to a remarkably agile response from players. Src:Card is a game of anticipation, defence and programmatic offence. The code based mechanics of the game are challenging for beginners and become more challenging as players become more adept at using the programming blocks. Src:Card was created by Sam Boychuk, Erwin Njembo and Jacob Grossman, each big fans of tabletop gaming and computer programming. After exploring research topics in software engineering education, Sam Boychuk – lead developer – determined that academics where stressing the need to teach programming students a handful of basic concepts. Two years ago Sam decided to create a Java-based visual programming language called Pipes, as a continuation of these studies. Six months ago, the team decided that the ideas in Pipes could be better represented in a tactile standalone card game. While incorporating cutting edge research in teaching programming, Src:Card incorporates foundational computer science lessons in an effort to entertain and educate players of the game. While it is the primary goal of the Src:Card team to entertain, they are confident that exploring foundational topics in computer science can introduce a whole new generation of technology enthusiasts to the world of software development. Erwin Njembo, a teacher and technology student stated “Src:Card is engaging, it is fun, it is competitive, it’s actually a game that keeps you on the edge, you have to use your brain all the time.” Src:Card is looking forward to releasing the game on Kickstarter immediately. Dieser Eintrag wurde veröffentlicht in Crowdfunding, English, Fun und verschlagwortet mit Card Game, Programming, Robots von Sebastian Trella. Permanenter Link zum Eintrag.